And just like that, we’re halfway there…. Last week was a good one and I felt like each run was a success. I met up with my good buddy Jen who is training for Chicago marathon. We kept the pace nice and easy and had a great run catching up. I haven’t been able to run with her as much as I’d like because of our different training plans/schedules so it was a good way to start my running week. I ended the month with another monster total mileage (for me). I also only missed 2 days when I had some shinny shin shin pain. Luckily, some modifications have helped it and I’m a-okay! This run had me scared as it was my first 8 mile tempo run (of three). The tempo runs are set up in thirds so that from here on it’s 3 eight milers, 3 nine milers, and 3 ten milers. So I’ll be having a medium-esque long run (10+ miles) on Thursdays from here on out. So the first one was tough…it was 84 degrees and 55% humidity at 4:45 in the morning and what has usually been a relatively comfortably hard pace was just brutal. Plus, I think I’m definitely feeling the accumulated fatigue now. The goal pace was 8:45 and this run was at about an 8:52 pace average for the 8 tempo miles. Ugh. This run was faster than it should’ve been (and shorter) because I skipped my early morning hill run workout to let my husband run. I keep saying I forget that he’s training for a marathon and I say that half jokingly, but I sometimes do forget. I’ve been pretty selfish about making sure *I* get my runs in and I haven’t been more accommodating to him. Side note: I’ve found Hanson’s to be a pretty lonely training plan. It’s so much running and pace specific that it doesn’t work well with running with other people. I’ve missed out on running with friends quite a bit and while I’ve tried to make it work, it can get tough with different training plans, different life schedules, kids, and a spouse also training. I switched my long run days so that I can run with friends (see Side note above). I have two friends also training for NYC Marathon and it has been difficult getting our schedules to match. I hate that we haven’t run together more, especially since we’re training for the same race. Anyway, it was a great run. I didn’t worry about my pace; the run was about hanging out with friends. At the mile 12 mark, my friend said she needed musical assistance so she plugged herself in and got in her zone. I started to pull away from her then as I felt good and I finished the last three miles at goal marathon pace–8:46, 8:43, 8:32. This is where I really feel/see the benefits of Hanson’s. I can’t believe I felt that good at the end of a 15 mile run. Easy recovery miles around my hood to finish off the week. 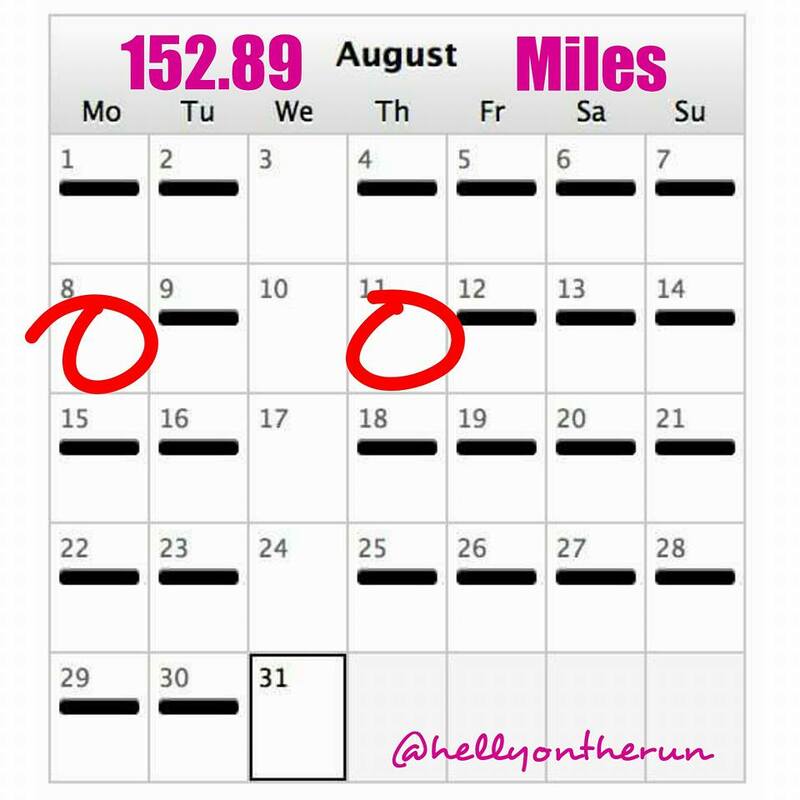 It was a 44.16 mile week of good running and I’m stoked to be at the halfway point feeling strong. I know things will start getting tough as the fatigue settles in and the mileage keeps climbing. Here we gooooo!!! –How many of your runs are solo runs? The majority of mine are and I don’t mind running by myself, but there are times when I really do enjoy company. Great week! 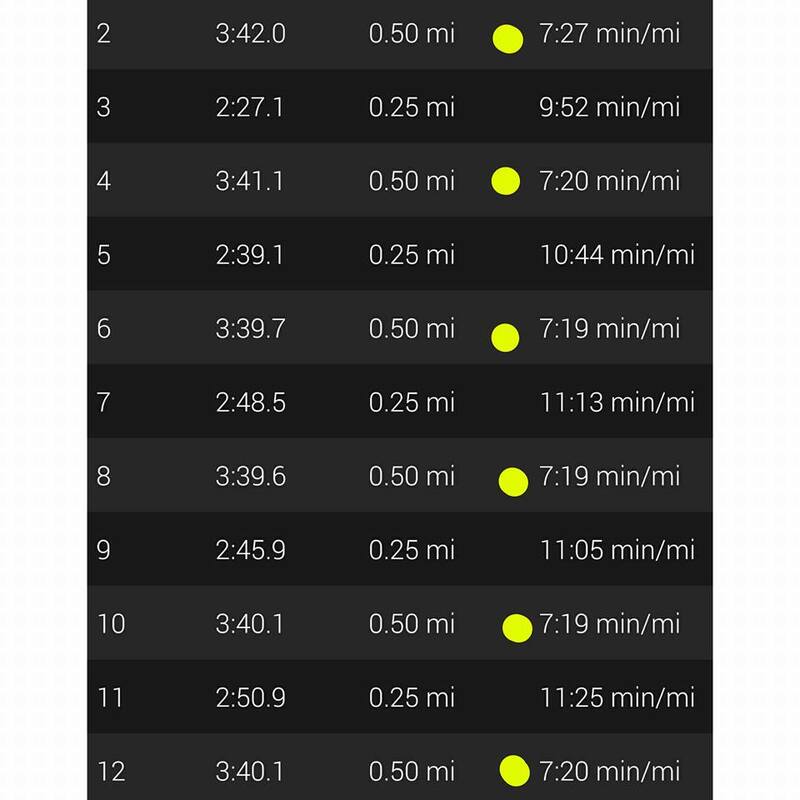 Nearly all of my long runs were solo for my last marathon training (2015). At first it was really hard to run that far alone, but I grew to really love it. It was my only true “me” time. I was always slightly jealous of those with “training partners” when I was training solo, so I get what you mean! It’s fun to run with people, too!!! Nice week. Solid finish on your long run. Gotta love when you can finish a long run strong! Most of my runs are solo, especially now that I’m in training. I’m neurotic about paces because of training. If someone isn’t feeling well and has to run more slowly and I’m forced to run more slowly, I’m upset because I wanted to go faster. If I’m running slowly because I’m not feeling well, then I feel bad for slowing people down. I run best with people who have the same pace and running philosophy as I do, run with group if it suits you, but speed up or slow down as you need to and don’t expect others to do the same. I definitely don’t expect people to adjust their pace for me. But, I’ve felt that people have expected me to do it and that’s where I’ve had trouble running with others this training cycle. I’m like you in that I’d prefer to stick to the prescribed pace and some people aren’t as stickler to paces as I am, lol! Great job on all your hard work! I was very happy to see how well you finished your 15 miles. I’m looking forward to reading how you do marathon day! Thanks my friend! I’ve been meaning to talk to you about this plan since we’ve discussed Run Less, Run Faster before. Even though it’s insane mileage, I’m liking this one better! I rarely run with my husband….like, super rarely, so when I do I actually like it, lol! Holy cow, this is a CRAZY running plan you’ve got going on there! I barely have enough time to get in my mileage for a half. I can’t imagine having the time or the energy for this one. You are a mileage and speed machine chica! So much greatness in this post, Helly! Soooo happy to hear that your shin is better and not giving you any trouble. Do you look at that calendar and feel so proud of yourself? Because you really should! 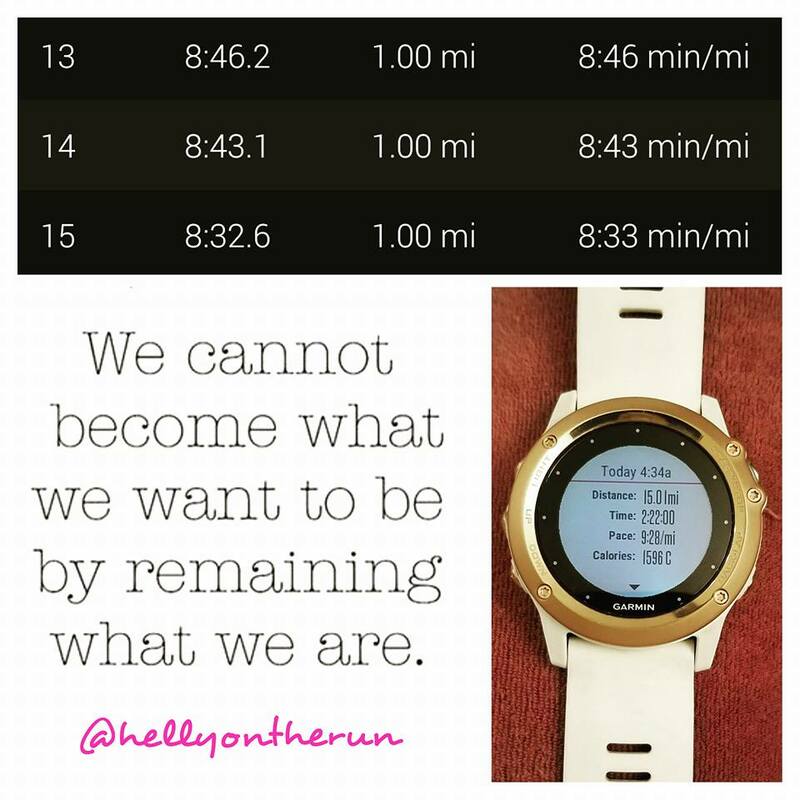 That is a fantastic tempo run this week and how awesome to have finished your long run so strong. I’m really struggling with my long runs this training and you definitely motivate me to keep at it. Yup! My husband is so accommodating to me, lol! And I’m like you. I’m pretty pace focused, sometimes not in a good way, lol! Nice job Helly! You are killing it and over half way there. I like the “me” time of long runs but I keep promising myself to find a run group. Soon. 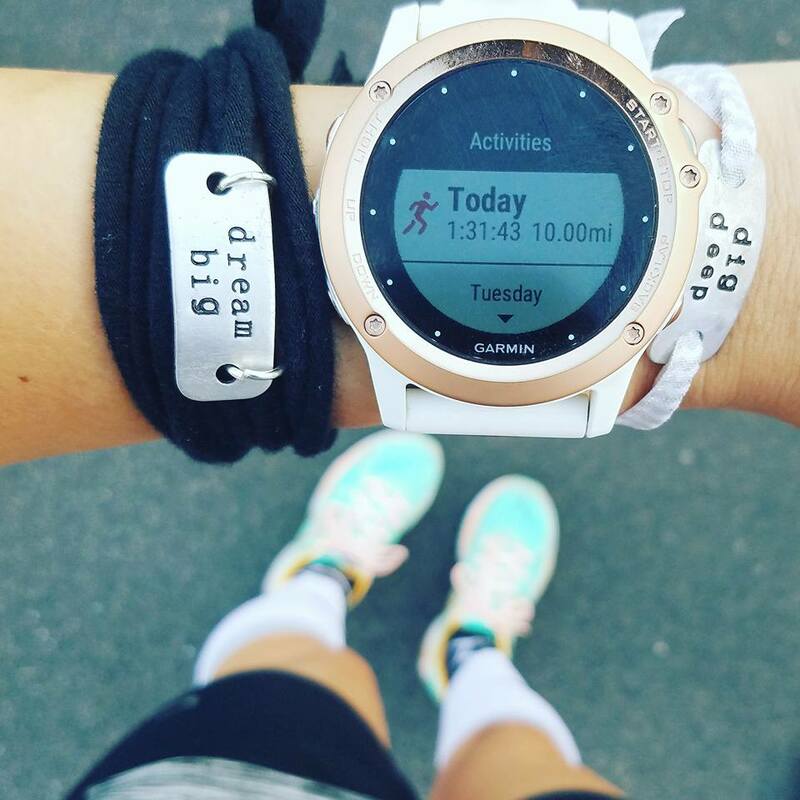 I think you have built a great running community for yourself and I’m totally jealous of that! Syncing schedules is hard too – especially with kids (and a husband training too)? you are doing a fabulous job of getting through the Hanson’s plan…i have the book but have not really considered trying it yet so it is great to read your progress and experience…your pace at distance seems to be getting stronger and you are doing an amazing job of keeping up with the training plan especially in that insane heat…and, to your question, i run almost exclusively solo…best of luck with the second half!! That’s great that you can run with other people who are training for marathons. Even if you don’t run many runs with them, it’s still someone to talk to about your plan and to maybe meet up with for shorter runs when you don’t feel like getting out there. I run solo here. But I live in a place where the average age is 65yo if you can believe it (I’m NOT 65 or even close). It’s difficult to find anyone who runs down here, let alone who is training for a marathon.